My moments are mostly empty, numb, paralysed, noise assaulted, pain filled, agonised; waiting for movement, waiting for thought, waiting for feeling, waiting for something to happen that does not harm or disturb me, waiting for quiet, waiting for pain to subside, even though it will not, does not, can not. Into this empty void of life comes awareness, just about its only gift. Awareness of being, not doing, awareness of time, awareness of what is important, awareness of life, of breath, of being, of God Himself, being here with me. Time stopped being linear a long long time ago for me. The future cannot be planned, the past cannot be well remembered, only the present exists. Nothing is predictable, nothing is plan-able, nothing is reliable therefore only being here, now, is important. Only the present is. That is what my life has become. Time has slowed. It seems to flow round me and by me, rarely stopping at my door. No visitors call here. No social events occur. Nobody thinks of including us in their lives, for interaction with the world, has become an utter torment to me and I am left behind or outside or more honestly, become invalid and invisible, not considered to be here anymore. Luckily, God and I know better. And the gift of life has become more precious, more conscious, probably more lived, in this place, in this way, in this physical agony of existence, where time loses meaning and the minutes do not get counted for nothing much will change and I can make nothing happen by my will or intention. Here, it is love that counts, it is peace and precious connectedness to the one I love, who loves me also. 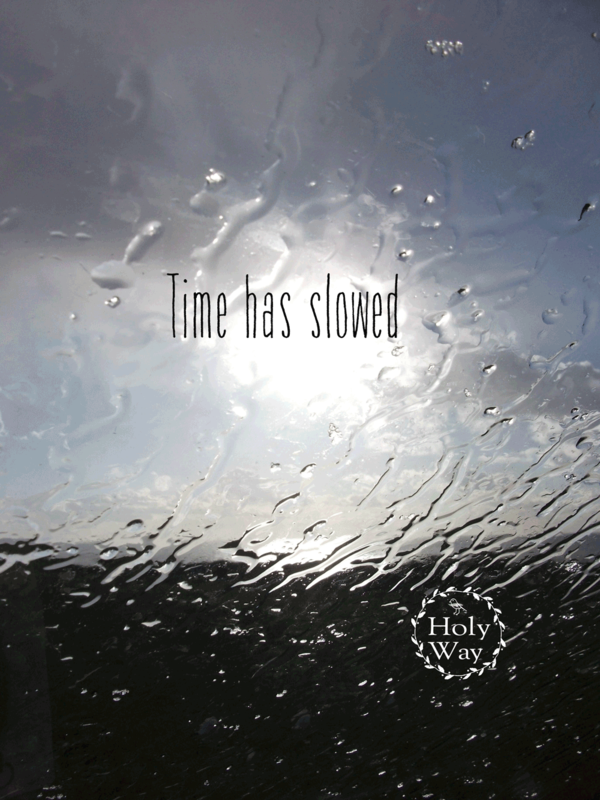 It is stillness and being that have become the bedrock of our life together, graced by God. When I am in the chaos of unutterable indescribable agony I cannot necessarily feel God. The power of the physical experience is huge, vast and all encompassing. I cannot bear the moment I am in. There is no other moment than this one and it seems to spread out to all eternity in an eternal moment of excruciating torture. All focus must be on coping, on bearing the unbearable, on remaining, on the pain itself, for there is no place that is not pain. All focus must be on coping, on bearing the unbearable, on remaining, on the pain itself, for there is no place that is not pain. There is no place that is not agony , there is no place that is not on fire with the violence of hurt, within the physicality of the body. 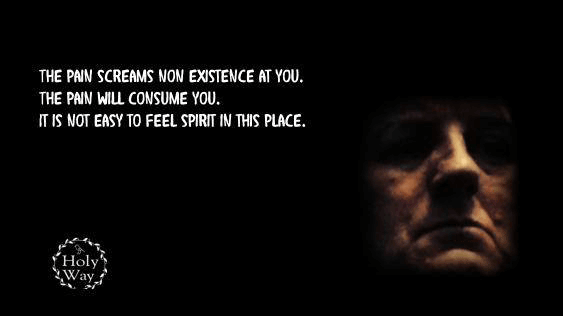 The pain screams non existence at you. The pain will consume you. It is not easy to feel spirit in this place. Your mind is huge , it can cry out, but whether it can hear or receive a reply is unlikely. The pain alone is all consuming. You just want it to stop. You do not know when it will kill you, for surely you cannot remain existing in such intense violation of life. , There is no place that is not on fire with the violence of hurt, within the physicality of the body. Jesus himself entered into this chaos state of extreme pain and distress when he called out :” Father why have you abandoned me.” This is often misrepresented by theologians as Jesus failing and by non religious as evidence that God was not there and that Jesus was wrong and doubted. But this cannot be so. For Jesus still called out to God, His Father. He knew He would hear him. He may have felt abandoned by the sheer wait and extremity of suffering and torture he was experiencing. Believe me, such extreme pain blanks the mind of understanding and reason, the burden of pain is intolerable, inescapable and you do not know where to place your awareness to cope with it. You do not know what to do, you are robbed of normal consciousness. Oddly though your awareness of yourself somehow expands. Each time I have had to endure unbearable pain or had a near death experience, rather than feeling diminished, my consciousness of me in my mind has been huge and strong. For my self, I have learned that the only way to endure such unendurable tormenting , beyond imagining, sheer pain, is, strangely enough , to go in to it, not resist it and to become incredibly still. This then is where I have come to find God unexpectedly close and present, even in the darkest place of my mind, where I have somehow dissociated and free floated within the pain. He too is truly there and has saved me. He has not necessarily done anything obvious. No words have been spoken, though God does speak to me and I have heard Him many times. In these profound places of extreme torment I have not heard His Voice , only sensed Him being with me. But only when I have gone right into the pain and not resisted it when there has been no resistance for the pain to react against. I don’t really have the words to describe the experience. It is more than torment, more than torture, more than indescribable, more than intolerable, more than unacceptable, more than completely unbearable. It is screamingly hostile and negating. It is barbaric in its cruelty. It is exquisitely diminishing. It is almost completely incomprehensible in its agony it is so vast, so punishing, so pure, so bleak, so empty of life and full of sensations that is beyond endurance. It is no wonder that Jesus called out to the Father and asked why had he abandoned him. Such is the nature of that place that all awareness can be blocked except for the pain itself that pierces every cell and every space between cells, every existing fibre of being is caught up in the torturing pain. God, who loves us still and holds us all, is helpless to help us in that place in the sense that He cannot reach us, even though he reaches out to us. He weeps for us. He weeps with us, yet the physicality of the pain is immense and unquenchable. There is no other feeling here. It is no wonder that Jesus sweated tears of blood and experienced real fear and longing to not take this path of the cross to death. For He had a choice. But once he had made His choice, he had no choice other than to see it through. His choice was then taken from Him till all that could remain was the choice to Love, which he did with immense Power and Grace. He held us all. In that dire pace. And He loved us, for that was all He could do. And he lifted us and carried us with Him through death ,which is inevitable for all humanity, unto the fullness of life which is a gift of God. His love pouring out from that nightmare of tortuous pain on the cross carried us all with Him, touched us all, gave us the gift of tenderness, compassion and knowing , that can only come through the violent damaging Horror of the cross in all cruelty and despair. It is no wonder he may have felt like God had abandoned Him for he not only felt his own pain but must have felt all that of all mankind for all time. To imagine the weight of his burden of pain is impossible. Our own pain is too much to bear. No wonder he was rewarded with the precious Gift of life, for he loved us all in that place of non- existence till the whole universe was filled with his love, his spirit, his light and its power returned to him in a miraculous healing power of Love. Love given out to the very last drop returned in splendour and power and awe and might. The light of life here with us all. The gateway opened for all time for the healing of every soul.